What is Forex News Trading And Why Is It Important To You, As A Forex Trader? Forecast or Consensus: This is a figure derived from a survey of economists, usually done by news agencies such as Reuters or Bloomberg. This Forecast number, represents what the market expects the release to be. For example, the US NFP (Nonfarm Payroll) is expected (or forecasted) at -320K, which represents most economists think (estimate, guess) that U.S. economy for that particular month has lost 320,000 jobs. Previous or Past: This is the actual figure for the previous month. Sometimes market looks at the current Forecast versus the Previous release to gauge improvement. This figure is also important because sometimes we will get a revision, or modification of the past release, which could also surprise the market. For example, let’s say that last NonFarm Payroll was at -467K, and this month we got a revision to -300K, which means last month’s NFP was not as bad as market expected, and this could lead to re-positioning of long-term trades and possibly add demand for the USD. Actual Release Figure: This is the actual release of the news from official sources. In the case of NFP, it comes directly from the BLS (Bureau Of Labor Statistics). If this figure is different from the Forecast number, then we have a Surprise that is definitely market moving. And News Trading takes advantages of this surprise. *** Deviation is simply the difference between the Actual and the Forecast figure. Based on a surprise factor, or deviation of 70K, we are going to BUY USD if we get a positive surprise (-320K + 70K = -250K), or we”ll SELL USD if we get a negative surprise (-320K – 70K = -390K, rounded off to -400K). The deviation is determined by looking at historical data of the past five years. This is the minimum deviation required for the market to move 70 pips or more for at least 70% of the time. 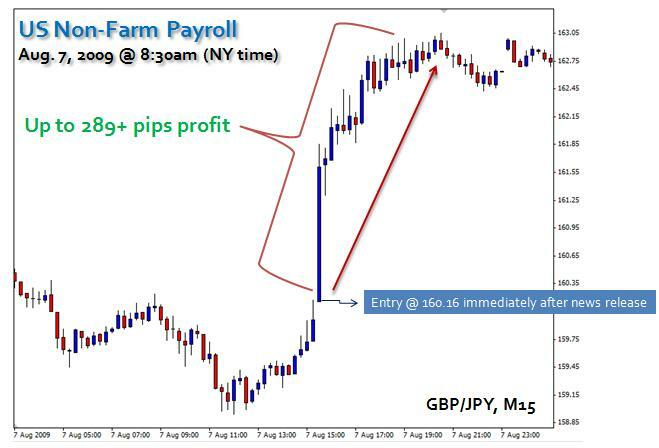 In other words, study every NFP releases for the past 5 years and look for market movements of at least 70 pips after the news release. Then calculate all of the deviations and figure out the least amount needed for the market to move 70 pips, at least 70% of the time… You can download my own Triggersheet along with a list of tradable releases by CLICKING HERE. Important Note: In the example above, I decided to go with GBPJPY instead of USDJPY as both pairs react to the news in the same direction, but GBPJPY usually moves more due to the volatility of GBP. This is advanced news trading based on experience and my special trading methods. Watch the video below for more information and don’t forget to read my news trading startup guide. Hi herry lue I use ctrader platform for trade , do you have cnt ea for this platform? At this moment it is not available. But as I have been saying, we are working on a newer version and hopefully we will launch it soon. somewhat with ref to gerhard comment of 22 january. This is one of the reasons we use CNT EA to trade spikes. CNT EA immediately cancels the 2nd order when the 1st one is picked up, which is difficult to do if you were trading it manually. Thank you for your good system and share this for all traders. I have some questions about how calculate 2H-50+ ,Range , Direction , Spike, if it is possible for you tell formula of this parameters. And a question is that the pending order is not guarantee from some brokers in High impact NEWS time. and sometime orders have large slipage (I work in alpari broker). Please help me and others traders how dose we done for this problem? Today I could install the EA on to my Platform. The system itself choose the folder where to install. But after installation and finish, the EA is not visible under the Navigation, Experts of the platform. You both may be busy. I will wait for your guidance. Pandupr2, this seems to be a typical issue when you try to install the EA in a MT4 platform using build 600 and above. We appreciate your patience as we’re trying to have a fix/update available as soon as possible. Please show the correct way of loading the EA onto my MT4 Charting. I am having MT4 accounts with Aplari UK & admiral UK, but I am unable to load the EA on any platform. These platforms are of build 600 compatable. When ever I try, a message pops up saying that the destination forlder is not the correct one. Please help me. Why EURCAD open sell stop at 1.4726 (about 150 pips difference to the value before the event, 09:59 EURCAD 1.4878. The same with AUDCAD open buy stop 0.9873 (about 150 pips difference to the value before the event, 09:59 AUDCAD 0.9718. Please explain, I don’t understand. Hi Gerhard, please check on your EA settings or reset your settings. By default, it should be 15 pips away from the pre-release time. Check if you have it set to 150 pips (maybe you entered 150 to compensate for 5-digit broker?). The only other reason is that your entries were slipped, but it’s unlikely to be slipped by that much. Good morning mr Henry i applied the news you sent for uk retail sale this morning but was not in my favour.your release reads sell GBPUSD which i did but lost money.could you please put me through the terms.also how can you help me to build my account to forestall a future recurrence. For the UK retail sales news, the CNT EA was able to pick up at least 30~35 pips. is the EA you are referring to different from the currency strength meter?if so what are the procedures for installing it on my trading account.Also would like to know if the EA will trade the currency pairs in which it will be installed?could you also kindly educate me about the forecast so i can know and determine the direction of a currency pair to forestall a future loss. I do not have any comment to post. My problem is that, i want to subscribe with your Live Trading Room. From your website you do not create any form of how someone can subscribe. Moreso, my country Nigeria is not allowed to open an PAYPAL account. The only means for me to be able to pay for my subscription is either through VISA CARD or WIRE(BANK) transfer. In the above illustration, I did not see you taking into account the actual news release in the analysis. I only noticed that you used deviation of 70k which you said was obtained after observing market for 5 years and the forcast of -320K. So where does the actual news release comes in? chuksoraka, in the above example, the actual release came out at -200K, well above the 70K deviation from the -320K forecast number. Therefore, this news was tradable, since it did hit our expected deviation. So could it be that because the -200K is better that the -250K that is why the market was a buy market? The “Results: -247K BUY Trigger Hit”, how did you get it? 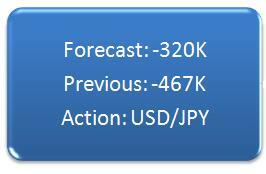 chuksoraka, the forecast is -320K, and the deviation is 70K, so if the actual is -250K(-320K + 70K) or better, we BUY USD. The actual release number came out at -200K, which is 120K better than forecast, so it definitely is a trigger to BUY USD. I thank U for that as per your saying I downloaded your CNT_EA but I got a doubt do I have to install this EA on each and every chart according to their concerned news release or is it enoudg ro get installled on one chart in MT4 terminal. For GBP related Highimpact news do I have to install EA on GBP/USD xhart. I request you to kindly clarify my doubt. i know that ur currency strength meter has a news broadcast and the final result news will be shown.my question is weather the final result news at currency strength meter is same as the time release news or delay in couple seconds with real time news release? by the w.ay thx for given us a big time during trading with smart move trade with news. It is the same as the real time release, but of course depend on your internet latency, you may get it one or two seconds later. Hi, I am new to news trading. I wonder whether you can provide a link to Reuters’ or Bloomberg’s forecast numbers. I have googled for hours, but I haven’t found them yet. You recommended tradethenews.com, and I wonder whether it offers any API so that the trading can be fully automated. Also, any other alternatives you would recommend? However, you may not need the numbers to fully automate news trading, there are alternatives that I am currently working on… Will keep you guys posted. I just contacted tradethenews. Will update you once I get a reply. You provide a trigger sheet. Hence, I believe that you must use a source’s forecast numbers as references to calculate the deviations. Would you mind sharing the source? I verified with someone. tradethenews does provide fixed machine read-able news. Sorry, I took it back. I just borrowed an account, and I didn’t see any machine read-able news on tradethenews.com. I will wait for tradethenews’ response. Thx a lot, Henry. I deeply appreciate your commitment to us novice traders. May God richly reward u. My name is RIYAZ AHMAD KHAN.I am from India.I am trading forex since January 2010.Still a new comer in this and found this field very much lucrative and excited.I am a business man on small scale and doing trading in Indian market since last 8years.Since I start learning about forex,I know you through FPA (Forex Peace Army) and found your analysis about news trade amazing.I Joined your website ans still receiving your mails about news trade. I need to ask something about the exact news online.Can you please suggest me from where I will get the news as soon as it get released during trade.I use internet which is not so fast as I reside in a rural area but it be fast soon InshAllah.Can you please suggest me any website or link etc which provide me the news release on time time so that I can make the successful trades according to your news analysis.I will be thank full to you for this kind act and also thank you for a free analysis,I really appreciate your work.Allah bless you with faith and more wisdom in your field aamin. I would recommend using a paid service such as tradethenews.com if you want timely access… but you can also download my Currency Strength Meter, as it now has the news broadcast feature for the news that I trade.